The Boat Races will take place this year on Saturday, 24 March, with the women’s race starting at 5.31pm and the men’s race at 6.32pm Luxembourg time. The Dark Blues and the Light Blues – Members of the Oxford University Society of Luxembourg and the Cambridge Society of Luxembourg – are invited to watch the races together on two big screens. As our traditional venue has closed down the venue this year will be Laurent Frideres’ house at 24 Route d’Esch, L-1470 Luxembourg. You are very welcome to bring your family, including your children. There’s plenty of space for them to play in the garden if the weather permits or indoors if it doesn’t. The doors will open at 5.00pm so we can get ready to watch the women’s race at 5.31pm. We will stock up on beer, wine and soft drinks and we will also make provisions for food and nibbles so we would like to have an indication of numbers. If you are planning to come, please let Laurent know at lafrideres@cantab.net. The doors will stay open after the races for an after party. This entry is filed under Events, newPOST. 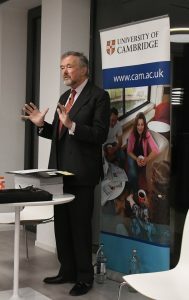 By invitation of the Conférence Saint-Yves, The Cambridge Society and the OUSL, Ian Forrester Q.C., judge at the General Court of the European Union gave a speech titled “EU Law after a Brexit” on Thursday, 18 January 2018, at the premises of Brown Brothers Harriman in Luxembourg. Judge Forrester started his speech by referring to the life of St Yves, the patron saint of lawyers, who was an eminent canon lawyer and therefore familiar with the tensions between local authority and papal authority. He then referred to the Reformation in Scotland in which that tension was crucial. In 1560, papal jurisdiction was abolished in Scotland. However, the long standing canon law continued to be applied in daily life as part of Scots law despite the disappearance of papal authority. Some things changed a lot and some things did not change. On this basis, he made an allusion to what he hoped could be the situation after a Brexit would have occurred. Judge Forrester addressed some of the detailed questions which a Brexit would need to address. One of his primary areas of focus was placed on technical regulations. By that, he meant rules and standards that are effectively set by experts in technical matters such as food safety, car design, financial services, police cooperation and protection of the environment. He noted there is a vast body of EU technical regulations currently in force in the UK and the other 27 countries. UK diplomats had significant input in the negotiation process that led to the adoption of these thousands of norms. It appears that the intention of the UK government is to turn the entirety of the words of this body of rules into UK legislation after the Act of Withdrawal. Judge Forrester suggested that, as time passes, there may be a need for new standards in these areas. The question will then be whether these new standards should be UK standards or EU27 standards. Many new questions would continue to arise since technology and human creativity are constantly generating new products and new techniques. UK agencies and officials will need to decide on those new products and there will often need to be a choice as to what the words of a regulation –originally drafted in Brussels by the officials of 28 countries but now part of UK law – mean. Those questions will from time to time give rise to litigation before UK judges. The question will arise as to how to interpret and apply in the UK the standards that were enacted when the UK was still member of the EU. Judge Forrester warned against those who would denounce members of the judiciary as ‘enemies of the people’ for choosing to give weight to the practices of the EU in these technical fields. Guidance will be necessary for the courts to assist them in knowing what weight to ascribe to EU precedents. An approach favouring alignment with EU27 standards would militate in favour of exports but might be criticised as being insufficiently British. Judge Forrester then moved on to describe the enormous size of the task that lies ahead for those involved in the Brexit negotiations. 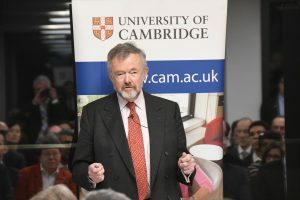 He gave a lengthy list of areas which will need to be addressed if a Brexit would occur, such as police cooperation in combating crime, recognition and enforcement of judgments in civil and commercial matters, sanctions and restrictive measures, access to medical treatment, fisheries, air transport, funding for academic research and the Erasmus programme. In view of the size of the task lying ahead, he called for calmness and thoughtfulness in the conduct of negotiations not only by the individuals conducting them but also by members of civil society. 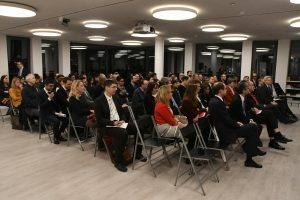 Judge Forrester’s talk was followed by a half hour of questions and answers during which guests, diplomats and officials were able to ask questions. The talk was well attended. 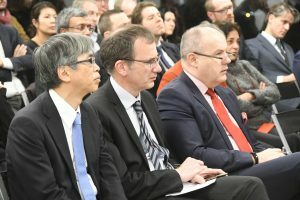 Members of the audience included the UK, Czech and Japanese ambassadors. Brown Brothers Harriman kindly provided for the drinks reception that followed that allowed members of the audience to interact with the speaker and with each other in a warm and convivial environment. "Genetics plays a big role in why some people are obese – but also, why some people manage to remain slim. Scientist… https://t.co/Cd15KgIEmp"
"Keeping things cool uses a fifth of all energy produced worldwide, and demand is only rising. Scientists from… https://t.co/UxfUHhmdCD"
"60 police officers are embarking on a new MSt course in police management @CamCriminology. The @Cambridge_ICE organ… https://t.co/8kBPqzCLVB"
"So we say farewell to our @TargetOxbridge students who leave Cambridge today after 3 days exploring the University… https://t.co/AZiqAERnwW"
"The fantastic @peterwothers wowing audiences! @Catz_Cambridge #chemistry https://t.co/eG5pcxixkI"
"Congratulations to Caucher Birkar, Peter Haynes & Richard Jozsa @FacultyMaths who have been made Fellows of… https://t.co/wLB19Mm4tU"